I am so lucky to have such a delightful design partner in Emily. We wrote our book together (9 Months of Knitting) and today I had occasion to think ‘I know her!’ with a little bit of glee. 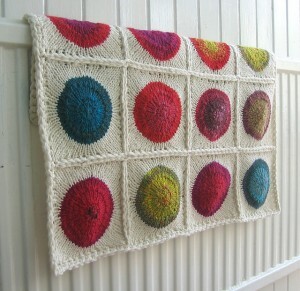 Her new blanket pattern, POP, is topping the Ravelry ‘hot right now’ charts! POP is a blanket that is perfect for a couple of types of knitters. 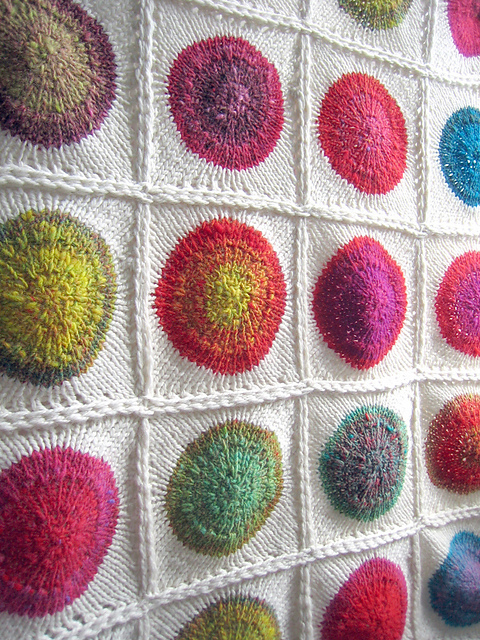 The first is the Noro addict. Emily is herself a sufferer of this affliction and wrote this pattern with just that colourful striping stuff in mind. The second is the hoarder of sock scraps, I started my own POP blanket last week with sock yarn held doubled for the colourful center and a worsted weight white for the border. Each square is worked from the center outward and the squares are all assembled later. This also makes POP the perfect travel project. Just pop a skein or 2 of Noro, and your chosen background colour in to your bag and you have hours of fun! This entry was posted on Sunday, May 20th, 2012 at 10:02 pm	and is filed under Uncategorized. You can follow any responses to this entry through the RSS 2.0 feed. Both comments and pings are currently closed. Gorgeous! Can’t wait to cast this on for someone special. Congratulations to Emily. Could I get instructions for knitting this beautiful afghan? The pattern is currently available through ravelry at the link above and print copies should be in the shop by next week.